Increase the efficiency of your system using the StarTech Serial LP PCIe Card. 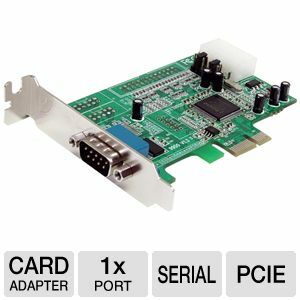 This wonderful PCIe Card transforms a PCI Express slot into a RS232 (DB9) serial connection allowing usage in Self service automated machines, POS retail applications, Bank Teller workstations, Standard ATM automated teller machines and others. This Single lane PCI Express ensures 48% less CPU load. Coming with One RS232 serial port, it offers speedy transfer of data. It goes well with Windows� 2000, XP, 2003, Vista�, Windows 7, Server 2008 R2, Linux Kernel 2.6.11 and up. 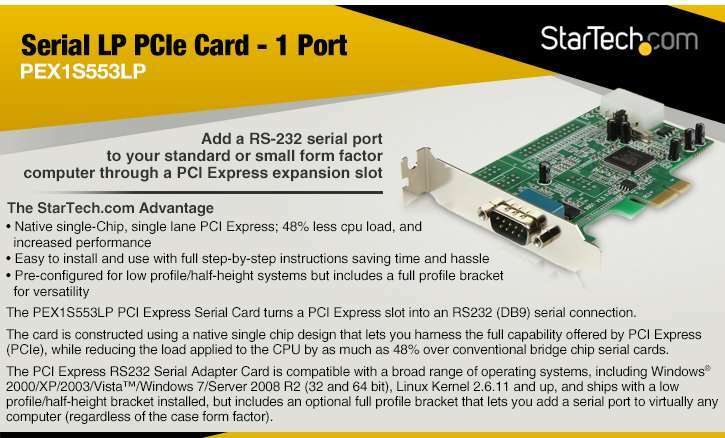 Get the StarTech Serial LP PCIe Card today.